Cat C and D write-off categories are being replaced with all-new S and N write-off classes. The changes, which come into force on 1 October, will focus on structural damage rather than cost of repair and should make it easier for insurers to take dangerous vehicles off the road. The new code follows two years of discussions with insurers, vehicle manufacturers, police forces and the salvage industry over the way vehicles are categorised for total loss. It is the first major change to the Association of British Insurers' (ABI) code of practice for 10 years. The new categories reflect the complexity of total loss vehicles more clearly, with the focus on structural damage rather than cost of repair. Cat A (scrap) and B (break) will be unchanged, while S (structural damage) and N (non-structural damage) will replace the old C and D categories. Guidance on salvaging motorcycles and quadricycles has been introduced and minimum qualifications are now required for all individuals who grade vehicle salvage. How will the changes affect drivers? The updated Salvage Code means vehicles which were structurally damaged but judged repairable will have the V5C marked with an 'S'. It will also state that the vehicle 'has been salvaged due to structural damage, but following a technical evaluation declared suitable for repair." Drivers should therefore have a better indication as to why an insurer has written a vehicle off. Whether it was cosmetic, light damage or structural. However, classic and special interest vehicles may be repaired irrespective of how badly damaged they are, providing it is safe to do so. In these cases, the Code of Practice will not apply. Modern cars are becoming more complex to repair and the cost of electronic parts on a vehicle can easily make the car uneconomical to fix. Insurers want prospective purchasers of repaired salvage cars and vans to be aware of whether the vehicle has structural damage or not. "Crude repair techniques from 20 to 30 years ago are being used to repair modern cars unsafely. 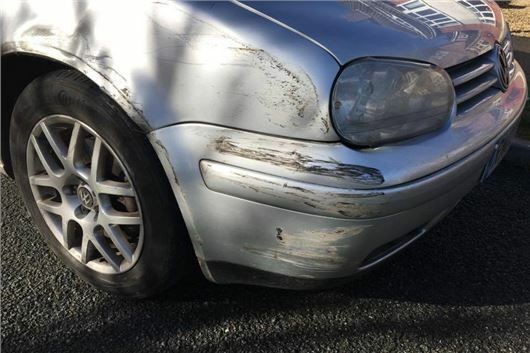 They appear to have been repaired safely, but are in fact death traps," says Tim Kelly, a council member of The Institute of Automotive Engineer Assessors. Will the changes help consumers? Hopefully. People buying second-hand cars will have a better indication of what damage a car has sustained in the past. However - as with everything - it isn't a perfect fix. The code is just as it is says - a code. It is not bound by legislation or law and there is nothing mandatory to enforce anyone, let alone insurers, to comply with it. This leaves the code open to dangerous issues. Companies that self-insure, like car hire companies, have no reason or duty to apply a categorisation to a damaged vehicle. In these instances, vehicles which are only fit to be crushed can end up on the road again with no history of damage. "Putting a complete stop to the unscrupulous activity of repairing vehicles that should be scrapped will require legislation," says Tamzen Isacsson, SMMT Director of Communications. What should I look out for when buying second-hand? Test drive the car to see what it drives like and watch out for anything suspicious, like slightly different colours of paint as this can suggest parts of the car have been replaced. Also check the service history to ensure there's no gaps, a car that hasn't been properly maintained can spell trouble. Some sellers try to pass off Cat C or Cat D cars as non-damaged motors by hiding their past. A vehicle history check, like HPI or Experian, is always advisable so that you don't pay more than you should for a previously written-off vehicle. Lastly, check online to find what similar vehicles are selling for - that way you won't pay more than the car is worth. All potential buyers must be informed of the car history for their own safety and the safety of the public. All dangerous cars must be removed from the public road. There are unscrupulous vendors out there who are only interested in the profit they make from unwary customers and some lie to get a sale. This is a long awaiting piece of legislation. There should be more information available to all potential second hand buyers so they can make a safety decision for themselves, their family and the public. Another expensive insurance ploy. To extract the maximum cash from car owners and reduce pay outs for damage. Sounds like what the DVLA done with road fund licences changed to emmisions more revenue to be extracted from the public. It's ALL ABOUT MONEY. No change apart from the lettering ?